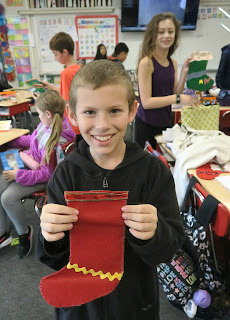 Back in my teaching days, my fifth graders would sew felt stockings by hand in December. 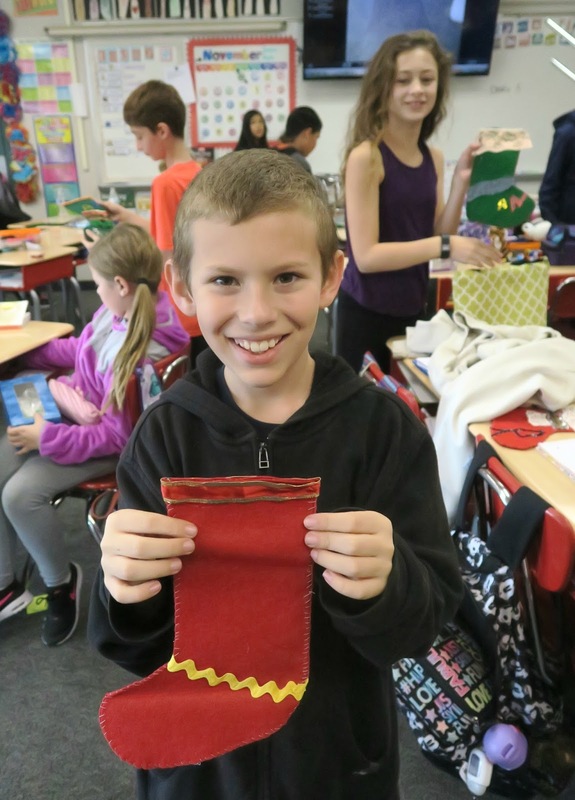 The project coincided with our unit on Colonial America, as the students were studying a time when people made virtually everything they owned by hand. The colorful stockings the kids made hung on our walls to decorate the classroom throughout the month. 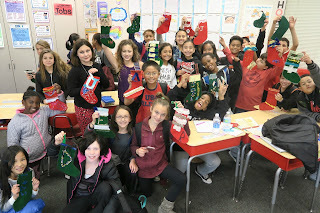 Then while the students were at lunch on their last day before winter break, their stockings would be magically filled with small treats and gifts for them to discover when they returned to the room. It was a wonderful way for us to celebrate together. 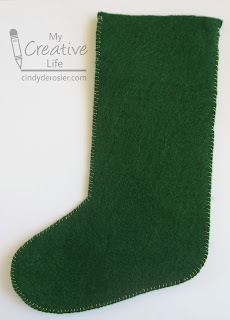 I had a class set of stockings cut and ready to go that I never used. I offered to teach the lesson to Trevor's 5th grade class and his teacher accepted enthusiastically. 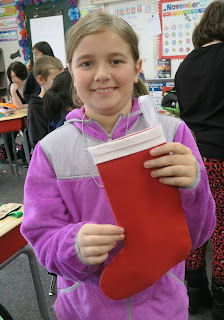 It was so much fun and the stockings turned out great. I've done a lot of volunteering in Trevor's classrooms over the years, plus I've worked with lots of small groups and even done a bit of whole-group teaching, but this was different. It was the first time I had taught a whole class of fifth graders (33 kids) in ten years. I loved every minute. In fact, it was so much fun that I'm going to be teaching in Trevor's class once a week for the rest of the year! I'll be sharing all of my favorite hands-on history activities, starting with the pre-Columbian Native Americans and continuing through European Exploration, Colonial America, the Revolutionary War, Independence and Westward Expansion. I'm sure that I'll share many of my lessons here. Anyway, back to the stockings. Each child got two pieces of felt (their choice of red or green), a needle and constrasting thread. I showed them how to thread a needle, tie a knot at the end of the thread, and hold the needle so that the thread wouldn't come out with every stitch. 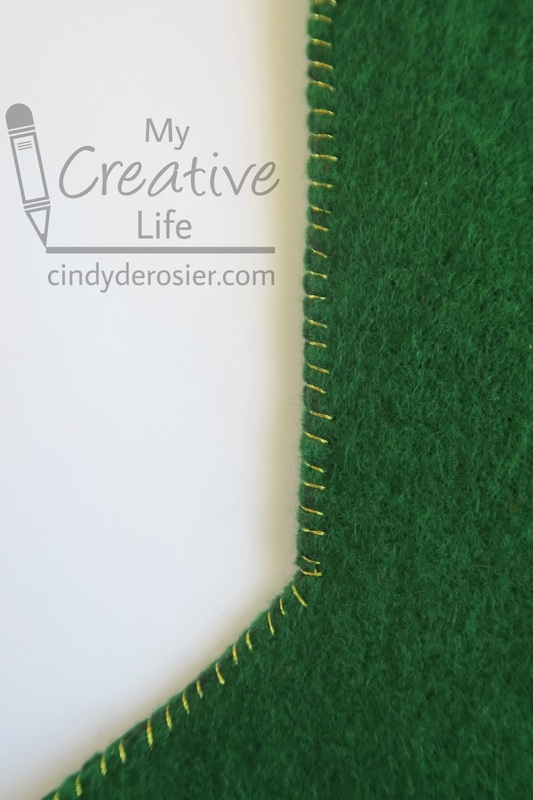 Then I demonstrated the whipstitch, emphasizing that they'd start from one top corner, continue down around the toe, and work back up the other side, leaving the top open. For many of the students, it was the first time they'd done any sewing. There were some struggles, but they kept at it. They were so proud of their work! 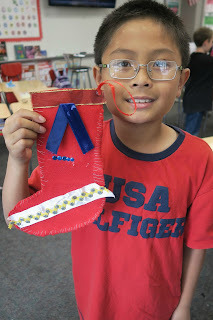 T was more typical in his decorating: three trims, a ribbon hanger, and sequins. D, like many others, used sequins to make her initial. Great job, fifth graders! I can't wait to share my next project with you all! Those look fabulous and how fun!!!!!!!!!!!!!!!!!!!!!! Looks like everyone enjoyed making theirs. Great job!